Learn what the Chinese characters mean! The following are selected important Daoist Chinese characters and their definitions. In Chinese, there are different styles to write a character. This is because the characters developed from Pre-Qin dynasty to today, went though many stages of development. The earliest discovered Chinese characters were found written on pre-Qin dynasty tortoise shells and animal bones (Jia Gu Wen) and this led to writing on old bronze wares (Jin Wen). Also popular during this era was Zhou Wen, Da Zhuan (Big Seal), and Xiao Zhuan (Small Seal). All these categories of calligraphy became collectively known as Zhuan Shu (Seal Style). The more popular and standardized Zhuan Shu is Xiao Zhuan, which came about because the first emperor of Qin dynasty tried to gather all the scripts at that time and this led to its creation. Zhuan Shu was difficult to write, so a version was made to make it more efficient which becamed known as Li Shu (Official Style). 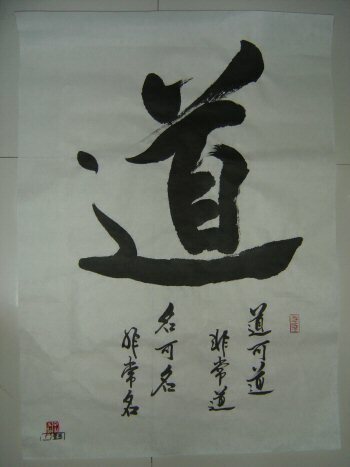 From Li Shu, calligraphers created a fast cursive style call Cao Shu. Li Shu also spawned the Kai Shu (Standard Style), which is the standard version you see in most Chinese newspapers today. Inbetween Cao Shu and Kai Shu is the Xing Shu, which is inbetween cursive and regular Kai Shu block structure. The China government in the 1950's simplified the Chinese characters into a version called Simplified Chinese, and the original one then became know as Traditional Chinese (used in Taiwan, Hong Kong, and elsewhere). Note that the Chinese characters in brackets used on this site are the Simplified Chinese Kai Shu version. 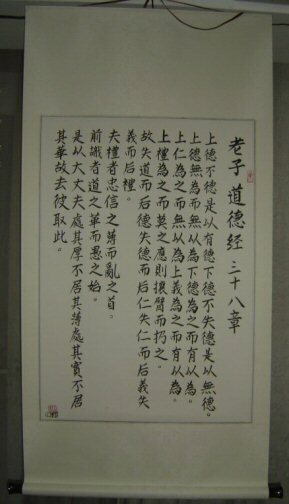 Since Lao Zi was in the Zhou dynasty (which is pre-Qin dynasty: See Chinese History), the Chinese style that the Dao De Jing was written in was a variant of the Zhuan Shu. "Dao" - Way "Dao" (way or path) is the main concept from Daoism. 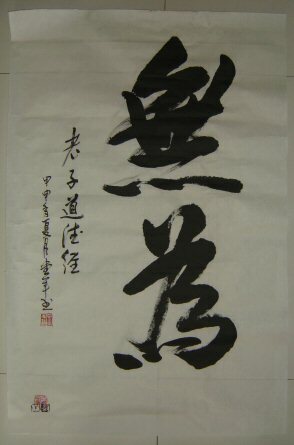 Below is the Kai Shu calligraphy style of the character Tao. 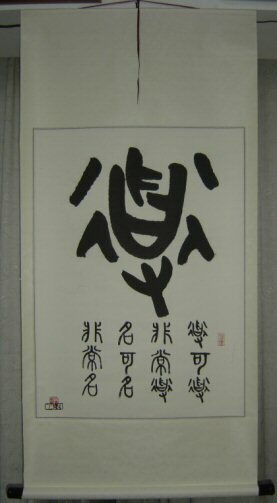 "Dao" - Way The same "Dao" written in Zhuan Shu calligraphy style (note the variation of Zhuan Shu writing style for character Tao). 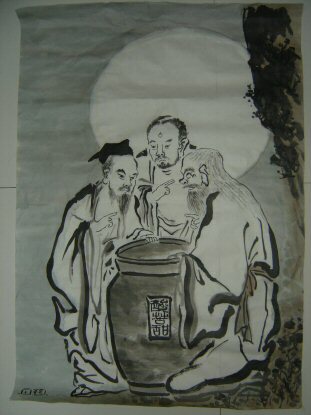 "Dao" - Way The Dao De Jing [Tao Te Ching] is broken up into two books, Tao (Way: Ch 1-37) and Te (Virtue: Ch 38-81). Below is Chapter 38 (first chapter of "Te") in Kai Shu (Regular Script) style. "Dao" - Way The Dao De Jing [Tao Te Ching] is the primary scripture of Daoism. 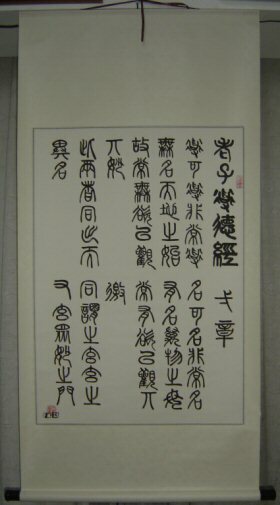 Below is Chapter 1 as it was originally written in Zhuan Shu (Seal Script) style. "Li" - Plum tree Li Er is the birth name of Lao Zi. 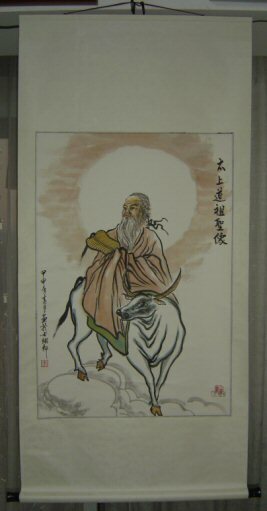 Lao Zi Riding Ox Li Er is the birth name of Lao Zi. 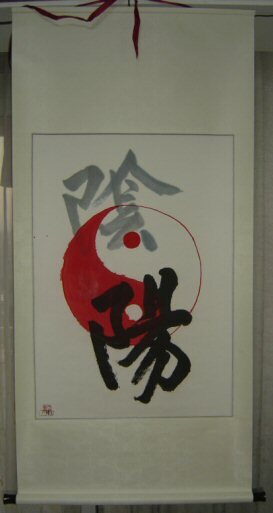 "Yin" - Feminine Yin and Yang are the negative and positive principles of the universe. If you do not see Chinese characters below in the "Character" column, set your browser to use UTF-8 (Unicode) encoding. 䨻 beng 52 roar of thunders 𩟼 ? 31 ? 龘 da 48 the appearance of a dragon walking 𩰈 ? 31 ? 䲜 ye 44 lots of fish 𨰺 ? 31 ? 䶫 yan 35 fine teeth, irregular teeth 鸝 ? 30 ? 䯂 shen 34 numerous; very many, large group of horses traveling in a line 𪈳 ? 30 ? 𪓇 ? 32 ? 𪛇 ? 30 ? 龖 da 32 flight of a dragon 𩱳 ? 30 ? 𨰻 bao? 32 ? 𩟻 ? 30 ? 籲 yu 32 appeal; request; implore 𨰹 ? 30 ? 䖇 yu 32 fragrant herb; fragrant plant; tulip 𨤼 ? 30 ? 𧖦 ? 32 ? 𤴏 ? 30 ? 𡯀 ? 32 ? 𦧃 ? 30 ? 𥾃 ? 31 ? 䉹 ? 30 ? 𧖣 ? 31 ? 韊 ? 30 ? Chinese Characters Made Up of Quadruplets of a same basic character. 㵘 man 16 great currents 𠈌 yu? 8 ? Chinese Characters Made Up of Triplets of a same basic character. 龘 da 48 the appearance of a dragon walking 㽓 ? 15 ? 飝 fei 27 ? 歮 se 12 ? 蟲 chong 18 worms; insects 𡘙 ? 9 ?